When it comes to top quality, professional office removals in Hampton, then we are the company of choice, so waste no time and get in touch with us, so that we can make your office removal, the smooth and manageable process you need and want it to be. We specialise in professional grade office relocation services and certain commercial removals as well. We work closely with the local commercial scene and know what customers expect of a well formatted office removal service that is actually worth it. Being a professional service provider it is our duty, to cover all aspects of the office removal and ensure all stages of the actual relocation process are carried out according to plan and schedule. Completing everything within the specified amount of time will ensure you and your business are settled and ready for work at your new address as soon as possible. Timely completion of the removal also minimises your business’ downtime and reduces lost profits, which is efficiency in motion. Being a top grade office removals company is not easy and comes at a price, but that is not a price our customers will have to pay, as working with specially trained professional movers, who know their work inside out will ensure safe handling and damage-free transportation of expensive office equipment and machinery. Avoiding the risk of damage or misplacement of items along the way is crucial for our customers, and in order to give them extra peace of mind and better service coverage, our mover teams will also deal with packing, securing and loading of items being moved. In case you are shifting the contents of multiple or identical offices, our movers will also make the time and effort to label and list the contents of items being moved, as this will make unpacking and distribution at your next destination much easier and more efficient. Fully comprehensive, end to end servicing is what customers need, and that is just what we provide. Top-quality office removals in Hampton are our business, and we will do our best to provide the right service. We are the favorite man and van technicians of the Hampton business owners because we have years of relevant industry experience behind our backs. During are careers we have planned and sought through an immense number of commercial removals and you can take our word for granted when we say that we can quickly and efficiently solve even the most complex moving conundrums that may occur during the execution of your relocation. 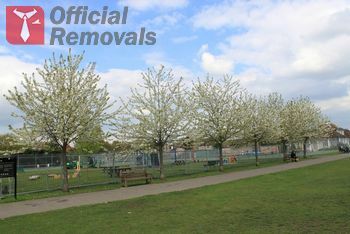 You should also note that we work in full accord with the highest international standards of the removal industry. Hampton is known throughout the English capital for being the location of some of the most beautiful churches in London. St. Mary’s Parish Church is considered by many to be the most fascinating religious edifice in the area. It was built during the 1830s and designed by renowned architect Edward Lapidge. The church is identified as a Grade II structure.